Microsoft, in a mysterious move, have offered anyone with a valid shipping address in the United States, Canada and the United Kingdom, a free TechNet Professional subscription. As Neowin points out, it may well not be for absolutely everyone, but it does appear to be so. Confirmation will be needed from Microsoft but as of yet, they are not commenting on this. Still, if it works for you, you will have access to a wealth of Office, Windows and Dynamics software for three months for absolutely nothing. Once you make your way through the online â€œorderingâ€ process, you will receive an email confirmation shortly afterwards. This will provide you with download links and your access information to begin downloading. Hmmph looks like the rest of us miss out. [Update]: Ars Technica is reporting that this offer may not be for one year as first thought, but only three months. Never-the-less, it’s best to get in early and make the most of this while you can. If you are a Microsoft Certified Systems Administrator (MCSA) or a Microsoft Certified Systems Engineer (MCSE) on Windows Server 2003, you can now transfer your skills to achieve multiple Microsoft Certified Technology Specialist (MCTS) certifications or Microsoft Certified IT Professional (MCITP) credentials on Windows Server 2008. For the first time, the transition path is available before the product release. If you have a Windows Server 2008 certification on your resumÃ©, you have an excellent opportunity to catch the eye of early adopter organizations. Microsoft Learning developed this transition path to recognize the investment and expertise you have demonstrated throughout your certification historyâ€”donâ€™t miss your chance to take advantage of these new certifications. Your path consists of one exam, which allows you to earn multiple Microsoft Certified Technology Specialist (MCTS) certifications on Windows Server 2008. From there, you can complete the remaining requirements for one or both of the Microsoft Certified IT Professional (MCITP) certifications for Windows Server 2008. Because there is a significant technology gap between Windows 2000 Server and Windows Server 2008, only IT professionals with specific Microsoft Certifications on Windows Server 2003 can utilize these transition or upgrade paths. In addition, there is no upgrade path from messaging or security specializations to Windows Server 2008 certifications. Microsoft has justÂ launched Microsoft Student Experience beta. The site contains information from Microsoft internships,Â getting discounted software ( e.g. obtaining Microsoft Office 2007 Ultimate for just $600) to a set of How-Toâ€™s. … for first time test takers, only students and faculty members and only applies to North America. Â Pearson is offering a free exam promotion, which will end on June 30th, 2007. The exam that qualifies for this free exam promotion is all 072 academic exams. Call Pearson VUE at 800-TEST-REG (800-837-8734) to schedule your free exam over the phone. All 072 academic exams qualify for this free promotion. You may take your exam at any Pearson VUEÂ® Authorized Test Center in the United States or Canada. Reference promotion code EXAM4FREE while scheduling your exam. Schedule and take your exam by June 30, 2007. Well, I am one of the VB insiders, we are talking about a video. This video is a chatting video between 5 guys from difference team(VB, C#, C++, Channel 9 interviewer). They are going to answer you few question about the language future from their view when developing CLR/LINQ/VB/C#/C++. But the point we VB Insider discussing is, one of them, Brian Beckman has spoken that he likes C# because of the “Operator Overloading” support. That means he does not know that VB.NET(Or shorten called VB9 now) also has operator overloading support. Another interesting issue I found afterward, I open up .NET Documentation, type the “operator overloading” keyword in Index Tab, I found a C# article(“Help me, I am overloaded”)Â on Operator Overloading and explain to you how to do so, why to do so(ms-help://MS.VSCC.v80/MS.MSDN.v80/MS.VSADD.v10.en/dncscol/html/csharp06212001.htm). But when I click in VB, it only shows you the “SAMPLE”(ms-help://MS.VSCC.v80/MS.MSDN.v80/MS.VisualStudio.v80.en/dv_vbcode/html/30202e10-8bdc-47dc-8fd1-f0ff9ffa0641.htm). Oh…god…no article in VB? How the VB beginner learn and understand it then? No wonder why he said the above comment. ï»¿How will imperative programming languagesÂ evolve to suit the needs of developers in the age of Concurrency and Composability? What role can programming languages play in enabling true composability? What are the implications of LINQ on the furture of managed (CLS-based)Â and unmanaged(C++) languages? 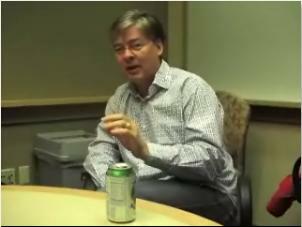 How will our imperative languages (static) become more functional (dynamic) in nature while preserving their static “experience” for developers?Â Answers to these questions and much more are to be found in this interview with some of Microsoft’s leading language designers and programming thought leaders: Anders Hejlsberg, Technical Fellow and Chief Architect of C#, Herb Sutter, Architect in the C++ language design group, Erik Meijer, Architect in both VB.Net and C# language design and programming language guru, and Brian Beckman, physicist and programming language architect working on VB.Net. The Windows Workflow Foundation (WF) runtime supports all CLS compliant programming languages. The Visual Studio 2005 extensions forÂ WF are only provided for C# and Visual Basic .NET. It’s easy to find C# samples to get started. Here’s some pointers to samples for getting started with Windows Workflow Foundation in Visual Basic .NET. If you have had a feel for Windows Vista (through beta’s or if you are lucky enough to own a copy even before it has been released this month) you could quite possibly start the year more qualified than anyone else in the field of this Operating System. How?…By passing Microsoft’s fourÂ brand spanking new Vista Certifications (Exam 70-620). Free 24/7 Instructor Led Courses on Microsoft products! No Strings Attached! Have you ever hope to have some trainings on Microsft products? Wait! What about Macromedia, Corel or even on managing your data center? Guess what? This training is not by Microsoft, but it’s by HP Learning Center. HP is providing free learning courses on 46 different courses which includes Software technogies (which includes Linux…), IT Pros, Business Skills, In-house Marking and Real Estate. I haven’t attended any of the classes yet, but I do suspect that somewhat the instructor will be introducing a lot of HP solutions to their students, it could end up into a marketing thingy from HP. Posted in Computing, Learning, MS News | Comments Off on Free 24/7 Instructor Led Courses on Microsoft products! No Strings Attached! I have recorded one webclass few months ago, it is about deploy VB2005 with ClickOnce. Althought this is nothing related to Vista, but I just want to share this with you, if you understand Cantonese, you may go and listen to it. Later on, I will do few more on Windows Workflow Foundation(WF), because I have writen few WF training guide, and it is now waiting approval to be post on MSDN site. Microsoft has put together a Hands-on Lab designed to educate developers on known Microsoft Windows Vista application compatibility issues.Â This process will walk the developer through specifics, focusing on solutions that will enable customers running your application to have a better experience on Microsoft Windows Vista.Â After completing this lab, the developer should be able to determine if and how the most commonly known application compatibility issues could affect their specific application. If you’re a developer (or just interested in application compatability on Windows Vista), youÂ can also head over to MSDN’s Windows Vista Developer Center for a wealth of resources on developing applications specifically for the new OS. Back by popular demand, Microsoft Certification Exam 70-500 will be made available in Beta form again starting October 16th and running through November 3rd! This is a Technology Specialist exam for IT Professionals in the mobility space.Â If you were unable to participate in the last beta because registration was full, make sure that you donâ€™t miss this opportunity! The Preparation Guide is available for the Exam at: http://www.microsoft.com/learning/exams/70-500.mspx. The soon-to-be-released desktop OS, Windows Vista, has been developed from the ground up and includes advancements in security and reliability, along with increased cost and operational efficiencies. For the IT professional, Windows Vista is easier to deploy, and less expensive to maintain, than any earlier version of Windows. And for your end users, Windows Vista’s improved performance and reliability add value by allowing people to be more effective while performing their jobs. Get an early peek at improved security, management and productivity by experiencing Windows Vista Beta 2 virtual labs. 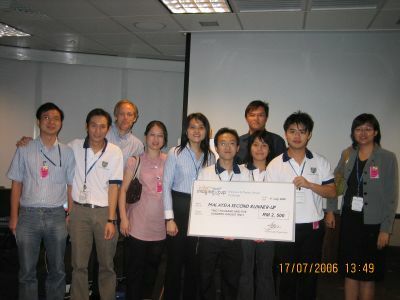 July 17th was the final leg of Imagine Cup 2006 in Malaysia. Many teams competed from round 1 onwards but only 8 means made it to the finals, and the finals was held in Microsoft Malaysia, KLCC Tower 2. My friends and I represented Tunku Abdul Rahman College with the topic “Aroma .NET“, and we managed to get 2nd Runner Up! Stress and other emotional/mental related problems have been in this world ever since humans are created and in today’s world, these emotional related problems are getting much more serious than yesterday. People focus too much on western medicine, and everybody knows that western medicine has their side effects on human body. Selecting the correct essential oils for aromatherapy session could be hard. People are not aware of what essential oils they are alergic or what essential oils to be used for a particular illness. Aromatherapy can actually help us in maintaining a healthy life and healing mental/emotional illness. (We did lots of research and this has been proven by Professors and Doctors worldwide). What we will do is to combine traditional therapy with current technology – Aroma.NET. A new sense can be controlled using electronic systems. Society will have less emotional/mental illness. such as .NET Framework 3.0 (previously codenamed WinFX). to see… with no framesets or tables – pure HTML, CSS and a little bit of PHP where I felt adventurous!